In this digital world of highly-developed science and technology, people are dazzled by the constantly changing info. And if you want to stand out your digital magazine, you will need to not only present readers with excellent and attractive content, but also enable them to access your magazine easily from different platforms: PC, Mac, mobile devices and different browsers like IE, Google Chrome and FireFox. What's more, you should provide readers with great user experience and make it easy for them to navigate through your magazine. This requires you to offer them easy navigation tools such as thumbnails, table of contents and most importantly, fast searching with keywords. And not surprisingly, Pub HTML5 can meet all above requirements. This online magazine software can help you convert PDF to HTML5 iPad magazines for PC, Mac and mobile devices within minutes. Besides, it will enable your readers to search what they want in the digital magazine by using the Keyword Searching feature. 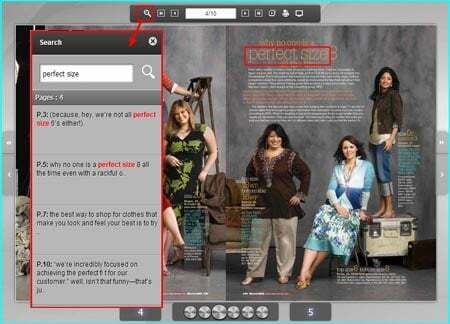 You can refer to the below steps to enable Keyword Searching in your digital magazine. 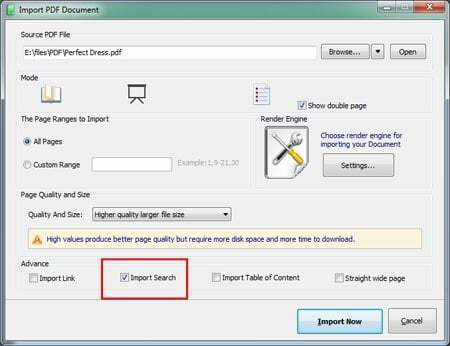 Start Pub HTML5 and click "Import File"; and after you select a PDF file, enable "Import Search" in the Import dialog and click "Import Now". In the Design interface, click "Custom Settings" tab and then locate Search button: Tool Bar Settings >> Config >> Search button. Select "Show" to enable the Search button, and then you can set least number of input characters, color for the Search dialog and font. Click "Apply Change" to save the settings and you can preview the effect immediately. Publish the magazine to local computer or upload it online to our Cloud Hosting.